The induction system brings in air from the outside, mixes it with fuel, and delivers the fuel-air mixture to the cylinder where combustion occurs. Outside air enters the induction system through an intake port on the front of the engine cowling. This port normally contains an air filter that inhibits the entry of dust and other foreign objects. Since the filter may occasionally become clogged, an alternate source of air must be available. Usually, the alternate air comes from inside the engine cowling, where it bypasses a clogged air filter. Some alternate air sources function automatically, while others operate manually. The carburetor system mixes the fuel and air in the carburetor before this mixture enters the intake manifold. The fuel injection system mixes the fuel and air immediately before entry into each cylinder or injects fuel directly into each cylinder. Aircraft carburetors are separated into two categories: floattype carburetors and pressure-type carburetors. Float-type carburetors, complete with idling, accelerating, mixture control, idle cutoff, and power enrichment systems, are the most common of the two carburetor types. Pressure-type carburetors are usually not found on small aircraft. The basic difference between a float-type and a pressure-type carburetor is the delivery of fuel. The pressure-type carburetor delivers fuel under pressure by a fuel pump. The fuel-air mixture is then drawn through the intake manifold and into the combustion chambers where it is ignited. The float-type carburetor acquires its name from a float that rests on fuel within the float chamber. A needle attached to the float opens and closes an opening at the bottom of the carburetor bowl. This meters the amount of fuel entering into the carburetor, depending upon the position of the float, which is controlled by the level of fuel in the float chamber. When the level of the fuel forces the float to rise, the needle valve closes the fuel opening and shuts off the fuel flow to the carburetor. The needle valve opens again when the engine requires additional fuel. The flow of the fuel-air mixture to the combustion chambers is regulated by the throttle valve, which is controlled by the throttle in the flight deck. The float-type carburetor has several distinct disadvantages. First, they do not function well during abrupt maneuvers. Secondly, the discharge of fuel at low pressure leads to incomplete vaporization and difficulty in discharging fuel into some types of supercharged systems. The chief disadvantage of the float-type carburetor, however, is its icing tendency. Since the float-type carburetor must discharge fuel at a point of low pressure, the discharge nozzle must be located at the venturi throat, and the throttle valve must be on the engine side of the discharge nozzle. This means that the drop in temperature due to fuel vaporization takes place within the venturi. As a result, ice readily forms in the venturi and on the throttle valve. A pressure-type carburetor discharges fuel into the airstream at a pressure well above atmospheric pressure. This results in better vaporization and permits the discharge of fuel into the airstream on the engine side of the throttle valve. With the discharge nozzle in this position fuel vaporization takes place after the air has passed through the throttle valve and at a point where the drop in temperature is offset by heat from the engine. Thus, the danger of fuel vaporization icing is practically eliminated. The effects of rapid maneuvers and rough air on the pressure-type carburetors are negligible, since their fuel chambers remain filled under all operating conditions. Carburetors are normally calibrated at sea-level air pressure where the correct fuel-air mixture ratio is established with the mixture control set in the FULL RICH position. However, as altitude increases, the density of air entering the carburetor decreases, while the density of the fuel remains the same. This creates a progressively richer mixture that can result in engine roughness and an appreciable loss of power. The roughness normally is due to spark plug fouling from excessive carbon buildup on the plugs. Carbon buildup occurs because the rich mixture lowers the temperature inside the cylinder, inhibiting complete combustion of the fuel. This condition may occur during the runup prior to takeoff at high-elevation airports and during climbs or cruise flight at high altitudes. 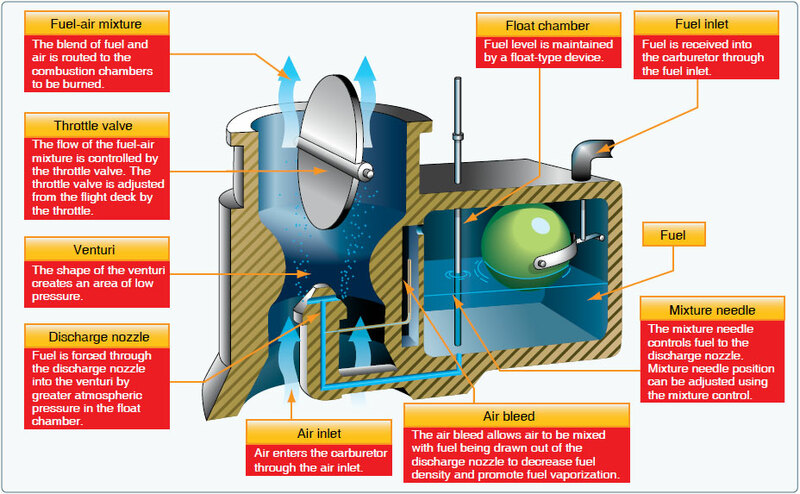 To maintain the correct fuel-air mixture, the mixture must be leaned using the mixture control. Leaning the mixture decreases fuel flow, which compensates for the decreased air density at high altitude. During a descent from high altitude, the fuel-air mixture must be enriched, or it may become too lean. An overly lean mixture causes detonation, which may result in rough engine operation, overheating, and/or a loss of power. The best way to maintain the proper fuel-air mixture is to monitor the engine temperature and enrich the mixture as needed. Proper mixture control and better fuel economy for fuel-injected engines can be achieved by using an exhaust gas temperature (EGT) gauge. Since the process of adjusting the mixture can vary from one aircraft to another, it is important to refer to the airplane flight manual (AFM) or the POH to determine the specific procedures for a given aircraft.